This book was pitched as "For Fans of Nicholas Sparks" and for anyone that knows me, that is all I needed to hear! Pairing a Nicholas Sparks-esque book with Young Adult(my favourite genre) I knew I was in for an epic win, and I was right! A Million Miles Away was everything I hoped it would be and more. I was a blubbering, sobbing mess numerous times will reading this book. All times seemed to happen in public, but I have no shame! 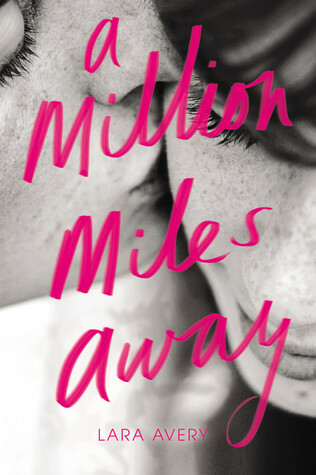 I will not hide the feels I get when reading an outstanding novel, and that is exactly was A Million Miles Away is. Let's start with Lara Avery's character building. She wastes know time introducing to us the two identical twins that will steal our hearts. They may be twins, but looks is where the similarities end. Kelsey is a outgoing dancer with a party-girl attitude while Michelle is the artist that sees the world in vibrant colours and wants to see every hue of it! And even though we know what is going to happen before hand, that doesn't make the blow of Michelle's death any easier, but she remains a very strong presence throughout the entire novel. Her death may come early, but we still get to know and eventually love this character...Both of them for that matter! Next up, is the unique plot-line. I've never come across a storyline quite like this one. A sister that fools her dead twins boyfriend into thinking that she is her...Sounds like a soap opera, but Avery delivers it in such a beautiful, delicate way that it doesn't not come off Soap Opera-y at all. It comes off as a heart-wrenching, raw yet beautiful read that I absolutely devoured! Peter, you will love him. You will absolutely adore this character! He is sweet, funny and even though he is a Military man, he is not afraid to express his feelings and show his vulnerable side. Yes, you will swoon. The simplistic cover is absolutely perfect for this novel! It adds mystery yet compliments the story behind it's cover just right. A Million Miles Away went beyond my expectations, and they were pretty big. You can't tell me a book will appeal to fans of Nicholas Sparks and not deliver. However, Lara Avery has earned herself her own major cred! I will now pick up any book in the future that says "Fans of Lara Avery"! YES! I have this book out from the library right now, but haven't gotten around to starting it yet. This review really makes me look forward to starting it though! That cover makes me want to drop everything and read it now; so gorgeous! This sounds so interesting! Great review!